1976 - 1980 United Way Budget Committee. 1977 - Captain, Panel II, Budget Committee. 1980 Elected Vice-President of Senior Citizens Board, LULAC Activity Center. Elected delegate to Legislative Conference for Senior Citizens. 1980 Received Award from University of Iowa Chicano-Indian American Cultural Center for her Chicano community related achievements and "continuing efforts to seek those elusive ideals in life: la justicia y igualdad para todos -- justice and equality for all." 1980 Selected to serve on Visiting Nurse Association Board of Directors. 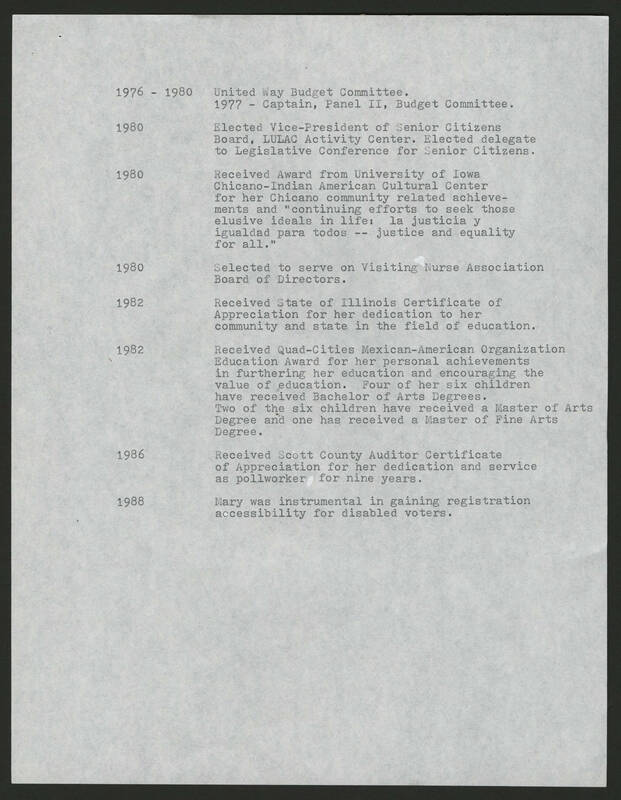 1982 Received State of Illinois Certificate of Appreciation for her dedication to her community and state in the field of education. 1982 Received Quad-Cities Mexican-American Organization Education Award for her personal achievements in furthering her education and encouraging the value of education. Four of her six children have received Bachelor of Arts Degrees. Two of the six children have received a Master of Arts Degree and one has received a Master of Fine Arts Degree. 1986 Received Scott County Auditor Certificate of Appreciation for her dedication and service as pollworker for nine years. 1988 Mary was instrumental in gaining registration accessibility for disabled voters.